It is this throne I wish to dwell on in this paper. To begin, let us start with what the throne was back in the day in which God made this promise to David. As you recall, Israel had angered the Most High when they clamored after an earthly king like the rest of the nations around them. Prior to that epochal period, God Himself was the King of Israel and ruled in the midst of the people from within the Holy of Holies, the tent that was located at the exact center of the camp surrounded by all the tribes. Within that Holy of Holies was the ark of the covenant, with its two cherubim overlooking the lid upon that holy vessel, also known as the mercy seat. There, the shekinah glory shone forth, although it was hidden from the sight of all but Moses, and Aaron, once a year on the Day of Atonement. It was from this place that the Lord ruled over the nation of Israel and it was here that was considered the place of His royal throne. Nothing of this great privilege mattered to this carnal seed of Abraham. The high honor of having the glory of the Lord in their midst with their King none other than the Creator of heaven and earth, was utterly lost on this wretched people who hankered after someone that they could see with their own eyes and would go forth to lead them to victory over all their earthly enemies. These same people then chose their king based on human standards of power and strength; they chose Saul who stood head and shoulders above his fellow countrymen. The scriptures make it quite clear how abysmal was that choice and the grief that his reign brought upon the nation. After Saul’s disobedience in the matter of the Amalekites, God informs the prophet Samuel that He has rejected Saul, the peoples’ choice, and instead will choose a man to be king over them, a man after His own heart. Enter David. Skipping over the trials and difficulties that young David faced at the hands of the envy-stricken Saul, who hunted him throughout the land of Israel, we watch him eventually become king in the land after the death of Saul and Jonathan. It is from there that David exercised his rule over the nation of Israel. Thus Zion became synonymous as the place from where the King of Israel will rule and where his throne was located. We will see this later in some of the Psalms that we will reference. We should pause a bit here and note something of importance. The throne of David was also known as the throne of the Lord. This is an important detail to take note of. The reason for this nomenclature is that the king was always considered to be a sort of vice-regent for God; an earthly representative of the true King of the nation, namely Jehovah. While a man occupied that earthly throne, it was understood that he was to be guided in his all decisions and policies by the law of God. This was commanded of the king by the law of Moses. Thus, his rule was considered to be the rule of God Himself. At least that was the intention! Sadly, fallen man will always disappoint and will always revert to his innate sinful tendencies apart from the grace of God. This now brings us to the heart of this paper and back to the text with which we opened this paper. This was the promise that kept many in Israel comforted during their times of distress. This “Son of David” as he became known, would be none other than their Messiah, the One destined to lead them to greatness once again. Time and time again, we see the people of Israel sin grievously against the Lord and incur His wrath in the form of the curses of the covenant (Deut 28) but we also see the Lord making mention of this promise as the reason why He did not utterly blot them out. Notice carefully the last verse in this quotation. A condition was attached to the continuation of this covenant with David. Eventually, the EARTHLY THRONE of David fell vacant on account of the disobedience of the descendants of David who sat on that throne. After the destruction of the temple by the Babylonians under Nebuchadnezzar and the subsequent exile of the nation into captivity for 70 years, the line of kings descending from David was no more. Some might want to say that Nehemiah or even Zerubbabel were continuations of the promise made to David but that is not the case. Nehemiah was merely the provincial governor of Judah under the Persian monarchs, not their king. Also, we have no conclusive link to David anywhere in his genealogy. Zerubbabel on the other hand is a descendant of David (1 Chron 3:19) but we have no evidence that he was regarded as a king over Israel after the captivity. True, there are passages in both Haggai (2) and Zechariah (4) which specifically make mention of Zerubbabel but there is nothing contained in those passages which we can point to as stating categorically that he inherited the throne of his father David or was actually viewed as anything other than the governor of that province of the then-Persian empire. After the death of the Greek, Alexander the Great, who conquered the Persian empire, the land of Israel was subjected to either the rule of the Ptolemies of Egypt or the Seleucids. It was not until the revolt led by the Maccabees that the yoke of the latter was finally cast off from the land. That led to the inception of the Hasmonean dynasty but note, there is no connection here between those descendants of Mattathias and the Davidic monarchy. If anything, the office of the high priest became more important than that of any so-called king. When the Romans under Pompey conquered the land of Palestine, the Hasmonean dynasty came to an end as Herod the Great was installed as the vassal king. Herod was not even Jewish but was instead from Idumaea, formerly known as Edom. By the time John the Baptist comes onto the scene, there is no king of David’s lineage ruling over the nation of Israel. Thus, it would seem the promise of God to David has been invalidated, something which is seemingly not possible. The Psalmist laments this in Psalm 89. The Psalm opens with a marvelous expression of the covenant that God made with David long ago. “My covenant I will not violate, nor will I alter the utterance of My lips. Once I have sworn by My holiness; I will not lie to David. His descendants (seed) shall endure forever, and his throne as the sun before Me. It shall be established forever like the moon, and the witness in the sky is faithful.” (Psalm 89:34-37). Here we see God actually swearing by His own holiness of the everlasting nature of this covenant promise to David. There can be no higher confirmation! Yet the Psalmist is in despair, in confusion, in the depth of uncertainty, as he surveys the current low condition of the nation of Israel and particularly the apparent lack of a descendant of David anywhere near a throne. It is evident that this Psalm must have been written sometime after the conquest of the land of Judah by Babylon. Perhaps it was even during the long days of Persian rule? Of that we are not sure, but one thing is sure, the Psalmist is lamenting the fact that it appears that the everlasting nature of the covenant promise to David that his throne would endure forever has failed, in spite of the oath of the Most High. The godly psalmist is struggling to understand what is taking place. “What has happened to your faithfulness O Lord?” seems to be the heartfelt cry of this man of God. This is where we get the first glimpse of the MANNER in which the LORD would actually make good on His promise to David. This is no small matter that we are speaking of here. It goes to the very heart of the nature of the fulfillment of this promise to David. Remember, God CANNOT LIE; If He has promised something that will endure forever, then it MUST endure forever or else He breaks His promise or fails to deliver on His promise. Thus His very faithfulness is called into question. Either are unthinkable to the One who knows and loves God. Now, it is a matter of fact that the earthly throne of David has ceased. It had ceased after the conquest of Judah as we already detailed above. At this point, it is impossible to even determine any sort of possible replacement of David’s seed since there no longer exist any genealogical records of the nation of Israel. All of those were destroyed in the Roman destruction of the nation, its temple, etc in the events which culminated in 70AD. If the promise of the throne to endure forever is to indeed be forever, it is evident that THIS THRONE does not exist on the earth in any form. The earthly throne of David and his seed is long gone. Where then does this ETERNAL THRONE exist? The psalmist answers that question – IN THE HEAVENS. That’s where! Now recall what we have previously established. The throne of David is also referred to as the throne of the Lord. The reason we have already stated – the one who sits on that throne, is the vice-regent of Almighty God Himself. God cannot break His promise or He becomes unfaithful. This matchless faithfulness of God to fulfill every single one of His promises is confirmed by having an eternal throne IN THE HEAVENS upon which sits the seed of David. Now who might that be? The answer is provided by none other than the angel Gabriel in his declaration to Mary that she would be the mother of the promised Messiah. “Behold, you will conceive in your womb, and bear a son, and you shall name Him Jesus. He will be great and will be called the Son of the Most High; and Lord God will give Him the throne of His father David and He will reign over the house of Jacob forever; and His kingdom will have no end.” (Luke 1: 31-33). It is evident that this Seed of David, to whom the promise was intended in its fulness was none other than our Lord Jesus Christ. He is the seed of David, or the Son of David, as the Jews had come to know this promised One by the time that Jesus came onto the scene. Just like all the promises of God which contain the idea of an everlasting covenant were fulfilled in Christ and His kingdom (the Passover, the Land, etc. ), so too was that promise made to David. That is the reason we see Matthew emphasizing the lineage of David in his gospel right from the very beginning in chapter one. This Jesus is of the seed of David, says Matthew to his primarily Jewish audience. Peter also mentions this specifically when he states that the PROOF that Jesus of Nazareth was indeed the Messiah, the Son of David, and that He had taken His seat on the throne of David, was the outpouring of the Holy Spirit on the day of Pentecost. “Brethren, I may confidently say to you regarding the patriarch David that he both died and was buried, and his tomb is with us to this day. And so, because he was a prophet, and knew that God had SWORN TO HIM WITH AN OATH TO SEAT ONE OF HIS DESCENDANTS UPON HIS THRONE, he looked ahead and spoke of the resurrection of the Christ, that HE WAS NEITHER ABANDONED TO HADES, NOR DID His flesh SUFFER DECAY. This Jesus God raised up again, to which we are all witnesses. Therefore having been exalted to the right hand of God, (seated on the throne – my comments) and having received from the Father THE PROMISE OF THE SPIRIT, He has poured forth this which you both see and hear.” (Acts 2:29-33). What could be more clear than this? The inspired apostle, speaking under the direct inspiration of the Holy Spirit on the Day of Pentecost, categorically declares that the promise of God to David that one of his descendants would sit upon his throne was specifically referring to CHRIST JESUS! It was the resurrection of Christ which then lead to his glorification some weeks later, which prepared Him to sit at the highest place of honor in the universe, namely the RIGHT HAND of God. That is where the throne of David is located. In the heavens! It was from that throne that He poured forth the Holy Spirit! “…but this is what was spoken of through the prophet Joel: ‘AND IT SHALL BE IN THE LAST DAYS”, says the Lord, ‘THAT I WILL POUR FORTH OF MY SPIRIT UPON ALL MANKIND…’” (Acts 2:16-17). Look at what Peter goes on to say about this promised Seed of David who would pour forth of the Spirit: “For it was not David who ascended into heaven, but he himself says, ‘THE LORD SAID TO MY Lord, ‘SIT AT MY RIGHT HAND UNTIL I MAKE THEY ENEMIES A FOOTSTOOL FOR THY FEET’”. The futurists (premillennial dispensationalists) tell us that during the millennium Christ will sit on a physical throne of David in the land of Israel, but that flies in the face of the assertion of the apostle Peter that Christ Jesus is seated on that very throne now ( the day of Pentecost some 2000 years ago!). The throne is in the heavens, not on the earth and will NEVER BE ON THE EARTH because the Psalmist tells us plainly that “IN THE HEAVENS” Thou will establish Thy faithfulness”. There are several passages which speak of this great King, this Son of David, taking His rightful place at the right and of God. “Lift up your heads. O gates, and be lifted up, O ancient doors, that the King of Glory may come in!” (Psalm 24:7). 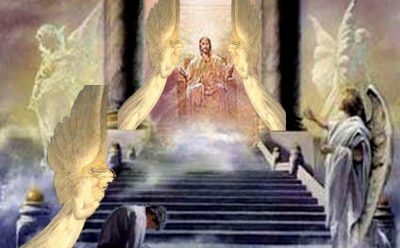 One sees a procession heading up into the heavenly Zion which has a set of bars, or doors or gates blocking entrance into its habitation. A voice rings out from the procession demanding entrance of the King of Glory into its gates. From within, a voice answers demanding to know the identity of this being. What more can anyone say to this scene than a thousand Hallelujahs! The mighty, conquering King, the Lord of Hosts Himself, the Son of David, the Seed of the Woman, has finished the work which His Father assigned Him to do. He has effected salvation for His elect, secured for them a perfect righteousness, defeated all their enemies, sin, the world, the grave, and the devil, and now is ready to sit down upon the throne of His father David and rule. What a perfect scene! The triumphant King parading His defeated foes before the universe as a spectacle! Who can refuse to open those gates now? “But we do see Him who has been made for a little while lower than the angels, namely Jesus, because of the suffering of death, CROWNED WITH GLORY AND HONOR…” (Heb 2:9). The dispensationalist (futurist) sees him waiting to be seated on His royal throne instead of ruling in splendor and glory NOW. As a matter of Biblical fact, He has been ruling on that throne of the Lord for nearly 2000 years already! Remember the point we made earlier in this paper – Zion became synonymous with the place from which the king would reign and where His royal throne would be located. And what is the result of that coronation and establishment of this King? Either one voluntarily casts themselves upon the mercy of this Great King, in which case his heart is broken in repentance as he mourns over his sinfulness and lack of righteousness, or his pride condemns him as an enemy to this Mighty Ruler, who will crush him to powder without mercy, shattering him like a clay pot. Another Psalm detailing the reign of this Son of David is one of the more frequently quoted psalms in the New Testament. We have already seen this particular psalm quoted by the apostle Peter who referred to its fulfillment in the resurrection and subsequent glorification of the Seed of David, the Lord Christ in his sermon made on the day of Pentecost in Acts, chapter 2. The King of Glory has come into the gates, taken His seat in Zion and begun to exercise his reign. He is crowned with GLORY and HONOR and wields a strong scepter with which he subdues His enemies. Either those enemies become His friends through repentance and faith as they yield to His servants and ministers of the gospel or they remain as His enemies, in which case He will grind them all to powder. This is a good time perhaps to show exactly how this stone fell upon the nation of disbelieving Jews. Here we see the refusal of a group of people to submit to the reign of a nobleman. To use the words of the psalmist; they refuse to bow down and do him homage. The result is inevitable, the wrath of the lord is kindled and they soon perish in the way. These enemies of the gospel and of the early church, the Jews of that day, were crushed by the iron scepter of Christ, this King ruling out of the heavenly Zion upon the throne of David. One last thing in touching on this topic lest we be remiss in so doing is to refute a destructive error that has been spread by some within the Preterist camp. The detestable falsehood which some in that otherwise theologically solid system of eschatology are proclaiming, is that the Lord Jesus divested himself of His human body when He was glorified. This vile teaching strikes at the very heart of the Christian hope of having our human bodies conformed to the glorified body of the Lord Christ. “For our citizenship is in heaven, from which also we eagerly wait for a Savior, the Lord Jesus Christ, who will transform the body of our humble state into conformity with the body of His glory, by the exertion of the power that He has even to subject all things to Himself.” (Phil 3:20-21). It should be clearly noted, that the apostle specifically declares that one of the kingly functions of the Lord Christ – the power given to Him to subject all things to Himself – specifically includes the transformation of the bodies of the elect into conformity with the body of His glory, or His glorious body. How this can supposedly be done by a King without a glorified human body, one who supposedly “divested himself” of his human body, is as great a mystery as they come! Essentially what these men teaching this nonsense are doing is destroying the humanity of the God-Man, the Lord Jesus Christ. Keep in mind that while the Son of God took to Himself our nature, except in His case it was in the likeness of sinful flesh seeing that He was not born of a human father but was instead born of God, He remained fully Divine even as He was fully human. Take away his body, and He is no longer truly human for what is man but body, soul and spirit? Man is not an angelic being. He possesses a physical body unlike the angels who are ministering spirits and do not possess physical bodies. Now as to what the exact nature of our bodies will be when they are glorified or conformed to the likeness of the Lord Jesus’ glorious body, one cannot truly say. What we do know however is that our bodies were meant to be redeemed ( Romans 8:23), that when He appears, we will be like Him for we will see Him as He is (1John 3:2), and that we will put off mortality and be clothed with immortality (1Cor 15:51-54); and that without a body of some sort, that which makes us fully human is not possible. With this in mind, let us visit a remarkable prophecy contained in the writings of the prophet Zechariah. “Then say to him, ‘Thus says the Lord of hosts, “Behold a MAN, who name is BRANCH, for He will branch out from where He is, and He will build the temple of the Lord. Yes, it is He who will build the temple of the Lord, and He who will bear the honor and SIT AND RULE ON HIS THRONE. Thus He will be a PRIEST ON HIS THRONE, and the counsel of peace will be between the two offices.” (Zech 6:12-13). Notice, a PRIEST KING, who sits on His throne. This is our Great High Priest, after the order of Melchizedek, the priest/king of Genesis who Paul references in Hebrews where he is thinking of Psalm 110: 1-4 where this same KING is mentioned in the first few verses of that Psalm followed by a priest after the order of Melchizedek. To rebut the foolishness of premillennial dispensationalism – if Jesus is NOT CURRENTLY SEATED on the throne of David, we Christians have NO HIGH PRIEST, because this priest sits on a throne and that throne is clearly revealed in the pages of the Old Testament to be none other than the throne of David. No THRONE, No KING; No KING, No PRIEST. This King must have a Throne or He is no Priest. This Priest must be a King or He is no Priest. If this Priest/King is not seated on the Throne of David, right now, not at some point in the future in some sort of fanciful millennium, then we HAVE NO INTERCESSOR between us and God. Just think about the ramifications of such a thing! This by itself, should be enough to obliterate every last vestige of the futurist scheme if they but understood the folly of what they are saying when they erroneously postpone that seating on the throne of David far off into the future and only for a period of some 1000 literal years. However, this can also be used to expose the idea of some sort of bodiless spirit of Jesus which is currently being espoused by some false teachers in the Preterist camp. Both promises are made to a MAN. “(Behold the MAN whose name is Branch)”. It is a MAN who sits on the Throne of David and it is a MAN who is the Great High Priest after the order of Melchizedek. To be a man, this mighty being must be fully and recognizably human and that He cannot be without some form of a human body. That body is a GLORIFIED HUMAN BODY, or we have no mediator and no king, at least not one that God’s promises are made good in. If Jesus divested His human body, as some of these false teachers are asserting, then the promise of God fails, something which is impossible. A MAN MUST NEEDS SIT ON THE THRONE OF DAVID IN ORDER TO VALIDATE THE PROMISE of GOD. This entry was posted in 2nd Coming, Dispensationalism, Eschatology, Norcini. Bookmark the permalink.